I Am Not a Kook – Sharing my adventures and misadventures with utmost sincerity, on and off since 2011. The time I forgot my helmet. When you anxiously anticipate a ride all week, only to have to sit it out in the end, you have a lot of time to sit and think. And to practice track stands. This blog promised kookiness and I hope this video delivers. My husband Ben and I had the best time in Iceland this July. If you, too, enjoy hot springs, camping, and puffins, or you’ve been wanting to see for yourself what the hype is all about, feel free to use our itinerary. Fly to Iceland with WOW airlines. Stretch out in XXL seats. Don’t get caught sleeping with your mouth open unless you really trust your seatmate. Stock up on beer and Brennivín in duty free. Get a brand new rental car–a white Hyundai hatchback will do nicely, but make sure you remember which white Hyundai hatchback is yours each time you try to get in. Make sure it has a navigation system since you’re directionally challenged. Frowning at that National Geographic Adventure map every few minutes isn’t fooling anyone. Pick up miscellaneous camping gear at Iceland Camping Rental, find a cafe in Reykjavík, get some caffeine in your bloodstream, text everyone that you’re alive and well, and get groceries at Bonus. Leave for Þingvellir National Park and marvel at how quickly your surroundings turn lush and magical. Set up camp and make dinner while trying not to inhale too many gnats. Take a late evening stroll to Öxarárfoss, a beautiful little waterfall actually created by the Vikings back in the day. Ben goes for the extra credit! Tour Þingvellir (aka Thingvellir), where Viking chieftains from around the country assembled and held the first parliament. If you’re lucky, your Icelandic tour guide will be moved to sing a few verses of a patriotic song. The Icelandic flag (far in the background) is near the site of the country’s founding. Continue your tour of the Golden Circle, stopping at the Geysir Hot Springs area, featuring mud pots, steaming pools of water, and of course a geyser that erupts every several minutes. You’re only 15 minutes away from the next marvel, Gullfoss–a very impressive two-tiered waterfall. Spend a leisurely morning at Gamla Laugin (Secret Lagoon) in Flúðir, a naturally heated swimming pool built over a hundred years ago. It accommodates multiple buses of tourists and has a modern cafe without sacrificing good vibes and rustic charm. Hike around Kerið, a volcanic crater lake, where the legendary Björk performed on a raft while the audience sat on the slope. Stock up on groceries again at Bonus in Selfoss (we probably should have joined a member rewards program) and follow the Ring Road in a counter-clockwise direction. Set up camp at the site of the iconic waterfalls Seljalandsfoss and Gljúfrafoss. Both falls are unique in that they are impressive yet approachable–walk behind Seljalandsfoss, and work your way underneath and around the rock that obscures the bottom part of Gljúfrafoss (the “Hidden Waterfall”). Don’t worry about getting the perfect photo and enjoy the splendor. Visit the black sand beach called Reynisfjara near the seaside village Vík and check out Reynisdrangar, dramatic basalt columns that looks like The Devil’s Postpile in Mammoth, California. The crowd thins out as you continue walking down the shore, but beware of rogue waves if you choose to do any rock scrambling. On the way to Skaftafell, you’ll pass otherworldly lava fields covered in a uniform layer of dried lichens for as far as you can see. Don’t pass up a small but beautiful canyon called Fjaðrárgljúfur. It’s a short detour from Ring Road, and a trail takes you along the ledge of the canyon all the way to the waterfall at the end. You might think you’ve seen all you can possibly see in one day but you’re just getting warmed up. This is summer in Iceland and the sun doesn’t go down for several hours. Once you get to Skaftafell National Park, you have a plethora of hiking trails to choose from. A relatively ambitious activity that would take some advance planning is a guided glacier walk, or you could do what we did and hike a trail that takes you very close to a glacier, which is pretty neat. End the day with a trip to Jökulsárlón, a peaceful lagoon filled with icebergs floating towards the sea. Some formations are Gatorade blue and others are streaked black with volcanic ash. Stay awhile and absorb the subtlety and the drama of the place. Keep an eye out for seals and for precariously stacked icebergs that are liable to crash down at any moment. Drive to Höfn, and you’re now in southeastern Iceland. The big ticket attractions are less concentrated once you’ve left the southern region, but the driving becomes even more scenic as the Ring Road follows the in-and-out curves of the fjords. In this small harbor village, fill up on some seafood and walk along the waterfront. Enjoy the relatively long drive to Egilsstaðir, where you’ll find a popular campsite and hostel. If there’s one must-see town in the east, it’s Seyðisfjörður, situated on the water. With a rainbow colored path leading down the main “street” to an adorable sky blue church, it’s a highly photogenic locale. Burn off some road trip snacks with a steep hike above the town, passing a few waterfalls and checking out the interesting art installation Tvísöngur, which is essentially a cluster of echoing concrete domes. Pick out some hand knitted souvenirs in one of the craft shops before moving on. After your second or third visit to the puffin colony, each visit more captivating than the last, get ready for another relatively long drive to Mývatn. Stop at the incredibly powerful Dettifoss, taking the route that leads to the protected side of the falls if tourists standing inches away from certain death makes you squeamish. Stop by a geothermal area called Hverir, where overpoweringly thick, sulfur-scented steam greets you at the parking lot. The bubbling mudpots and steaming fumaroles are delightful to see close up. The area’s major campsite, Bjarg, is situated on the shore of the volcanic lake Mývatn, boasting an idyllic background that admittedly is somewhat hard to enjoy in the rain. Fortunately, most campsites have indoor kitchen areas and this one is no exception. After dinner, visit the Mývatn Nature Baths, known as the Blue Lagoon of the North, and in my humble opinion the best Blue Lagoon of them all. (Full disclosure: we skipped the most famous one, near Reykjavík). Relax in luxury, have a lifeguard bring you a beer, and gaze at the surrounding landscape until closing at midnight, when you’ll have the whole place almost to yourself for awhile. The Nature Baths may be the ultimate highlight of Mývatn, depending on whether or not you’re a huge Game of Thrones fan, in which case another hot springs competes for #1. The water filled cave Grjótagjá used to be a popular bathing spot, but the hot spring itself is now off-limits to the public. Now, it is known for being the location of a steamy scene involving Jon Snow. (I’m not a GOT fan myself but it was pretty cool.) From there, hike on over to the humongous crater called Hverfjall, which measures over a kilometer across at the rim. Another sight worth seeing is Dimmuborgir, a lava field where jagged, towering rock formations and caves inspire stories about trolls. A rare sighting of one of Dimmuborgir’s legendary Yule Lads emerging from his cave dwelling. Continue one of the final legs of the Ring Road trip, stopping at Iceland’s second largest city, Akureyri. There is plenty of shopping, dining and drinking to do in town, not to mention an interesting church and botanical gardens to explore. However, we spent most of our time at Hamrar, another awesome campsite featuring a ropes course and other remnants of a kids’ sleep-away camp. One more fantastic hot springs experience awaits you. Set the GPS to Hveragerði, not far from Reykjavík, completing your circumnavigation of the island. From a convenient parking lot near the campsite, a trails leads up and along the springs river, with green rollings hills and steam rising up everywhere you look. After passing several boiling pools, you’ll come to the part of the river, marked with partitions to change into your bathing suit, where the water is just right for a soak. Spend the day in the capital doing whatever your heart desires. The National Museum has a fascinating collection of artifacts from the Settlement Era as well as religious art and contemporary objects. You can even try on traditional women’s riding garb (it’s very cumbersome). While going out is expensive anywhere in Iceland, there are happy hours to be found all over Reykjavík, and we even chanced upon some free live music. Find the locals’ favorite hot dog cart for a relatively cheap snack. For dinner, definitely go to The Sea Baron restaurant in Old Harbor for lobster soup and salmon skewers. There were probably ten ingredients total in our meal and it was perfect. Squeeze in one more activity, or just find a good breakfast spot, and begin your journey home. I’ll admit I find modern art kind of baffling. I doubt I’m alone in this, since there’s no objective way to label a thing art or not art. 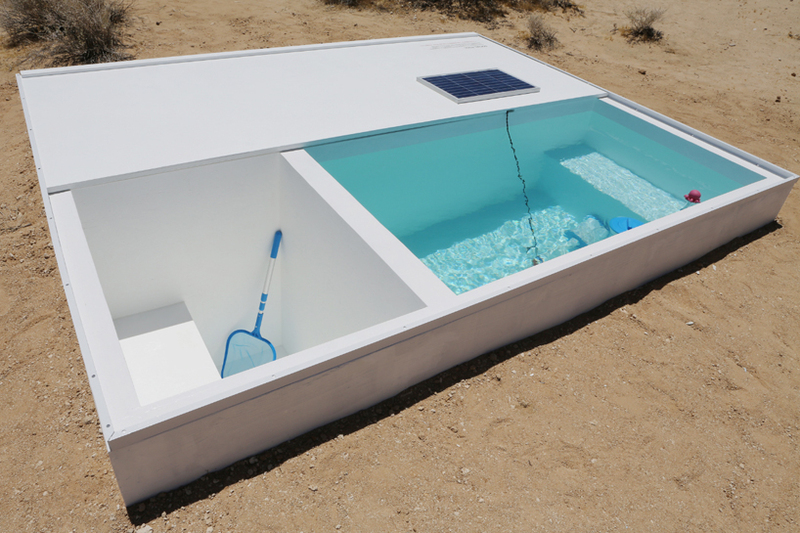 But a new installation piece called Social Pool has me more than confused. It’s a puny bathing pool in the middle of the Mojave Desert, made all but inaccessible (on purpose! ), and its very existence has me inexplicably peeved. The artist hopes that visitors will have an epiphany about their role in a society dominated by consumerism, or something like that…that is, if they can even find the pool. And if they fail, well, that also says something about consumerism and the pursuit of luxury, supposedly. One LAist writer dubbed Social Pool “obnoxious,” while another LAist contributor went to the installation and didn’t have anything snarky to say at all. Without going for myself, I can’t say for sure whether it’s a waste of water or whether it’s a worthwhile experiment. 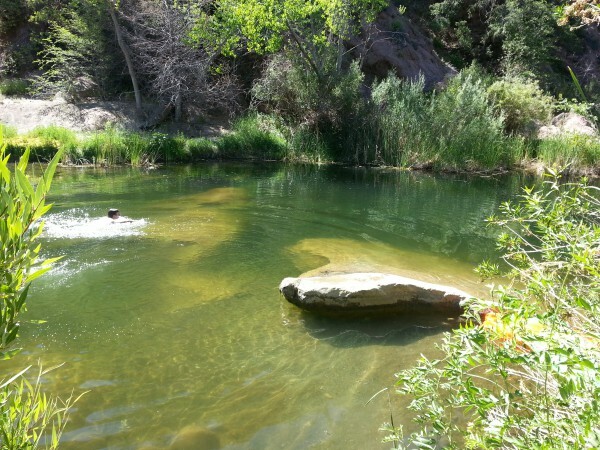 Because I suspect the former, I’m going to offer up one of my favorite places to take a dip–the Bear Creek Campground swimming hole–as an alternative to Social Pool, so that you don’t have to get lost in the Mojave Desert and die. In order to sit in Social Pool, the visitor must first visit a museum to pick up the key and the GPS points, because the pool has a locking cover and no signs or markings to find it from the highway. 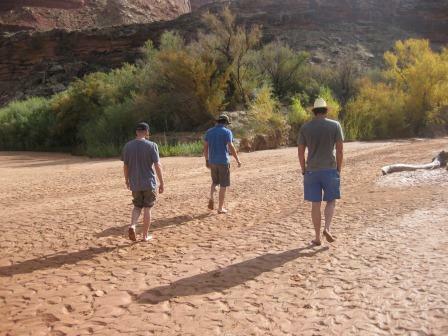 Plus, it’s a considerable walk over the hot sand from the road to the pool’s location. Here’s another idea: Google directions to the Piedra Blanca trail head, in the Los Padres National Forest’s Sespe Wilderness Area, and drive there. Park for free. There’s a large trail map there–no need for GPS points. 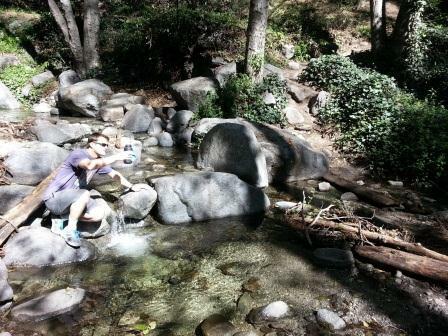 Follow the well-worn trail about 4 miles to Bear Creek campground, where you will find the swimming hole. Most accessible pool goes to: Bear Creek Swimming Hole. While there’s a fun scavenger-hunt aspect to Social Pool, I don’t have the patience or flexibility to go to a museum to pick up a key that may or may not be checked out already. 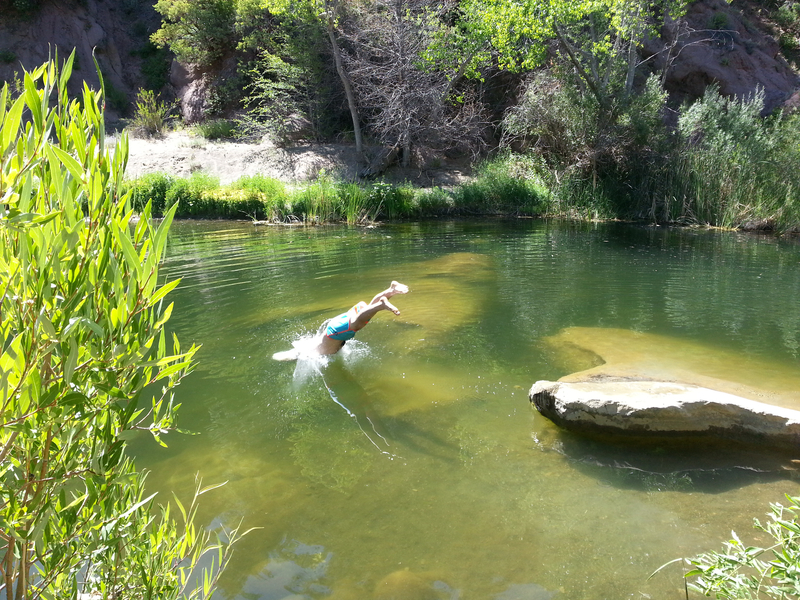 If it’s a challenge you’re after, reaching Bear Creek requires enough effort to make the swim feel well-deserved. Social Pool is the size of a small hot tub and the rules allow only four occupants at once. At Bear Creek there is sufficient water for actual swimming, even in summer during a drought. There is room for you, a few friends, other hikers and their friends, and so on. You can sun your pale skin on a wide, flat rock, dive in when you get too hot, and repeat. Best pool for swimming: Bear Creek, obviously. Enough logistics! Now, do you like being encouraged to over-think your entertainment and leisure choices? Do you believe that total mental relaxation and detachment from society are for those who lack culture? Then Social Pool could be for you. The difficulty of accessing the installation is meant to provide the visitor opportunity to reflect on why she is willing to go through such pains. On the way to Bear Creek, you’re allowed to think about how pretty the wildflowers are, or about how you wish you’d brought stuff to make s’mores. And then, once in the water, you’re free to let your mind enter a blissful, meditative state, punctuated by the croaking of bullfrogs. It’s mostly true that nobody walks in L.A., but I dare you to try and find an Angeleno who is not all about hiking. This has been the case since the city’s real estate boom in the 1880’s, kicking off L.A.’s “Great Hiking Era” during which the San Gabriel Mountains served as a rugged frontierland for nostalgic urbanites. Resorts popped up like wild flowers over the years. Alas, due to fires, extra-dangerous road conditions and other hazards, these “Hotels in the Sky” and supporting infrastructure have long been abandoned or torn down, the remains attracting modern-day hikers. But I salute those visionaries who sought to civilize the mountains above Los Angeles. They saw potential for development and profit where we now see potential for the preservation and enjoyment of nature. But I do sometimes long to be one of those early 20th century ladies, trying to ride a burro up a gnarly trail whilst dressed in a long wool skirt. (I mean, they knew how to picnic.) Now that nearly every corner of the globe and select bits of outer space bear the markings of human civilization, the frontier exists not so much as potential real estate but as a virtual place where new ideas sparkle like the lights of Los Angeles seen from the Mount Wilson observatory. In lieu of true, utter wilderness, all I can ask for is the illusion of isolation, the chance to demonstrate my enviable survival skills (I must be part Australian) some endangered bird-sighting, and as a bonus: hot springs. 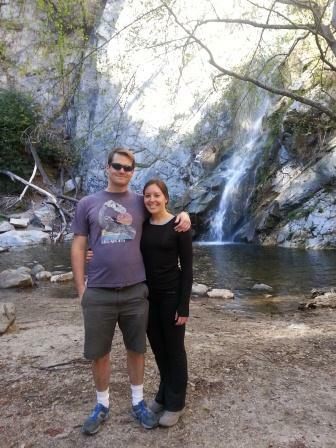 There were no hot springs on this San Gabriels trip, where we explored Chantry Flat in Big Santa Anita Canyon, but a creek and waterfalls more than made up for that. 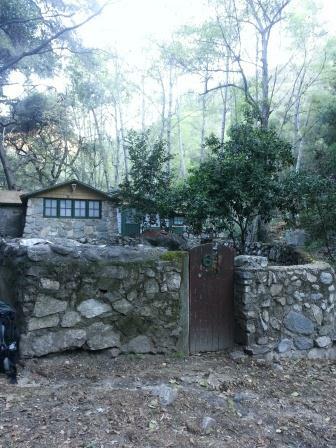 There are 81 cabins in Chantry Flat in Big Santa Anita Canyon (we passed about a dozen on the trail). Needless to say there’s no electricity or internet; residents get propane and supplies carried in by pack animals and can make calls on a crank phone. Four miles from the trail head we came to Sturtevant Falls, had breakfast (it was still only about 8:30 am) and picked up some trash before taking a photo. The trail continues up above the fall where the creek gathers into pools full of WHAT DO YOU MEAN NO TROUT? 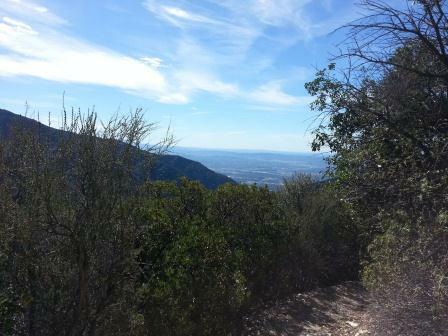 We still had the whole day ahead of us upon arriving at the campsite, so we hiked to the top of Mount Wilson. The trail occasionally opens up to these views. Also I thought I heard a mountain lion but it was Ben’s stomach. Ben examines river water for tadpoles before purifying. You could do this long hike in one day, but we can’t pass up a campsite without pitching a tent and sleeping next to a river. Try it out and thank me later. And if you go here, keep in mind the parking lot fills as soon as it opens at 6:30. We witnessed an awkward parking spot duel on the way home. The only sound came from the water lapping gently against my board. I let myself be idle, like a sea lion lazing on a buoy. I hummed a Lady Gaga song that had been stuck in my head all morning, but found I was not annoyed. I wondered what Lady Gaga would do in my current situation, and figured she would feel rather at home in a full-length rubber suit not unlike a catsuit. I could see her now, determined to surf while wearing platform shoes covered in raw meat. I snapped out of daydreaming as my board started to rock. There was movement on the horizon and I paddled toward it. Way out there were perfect, mesmerizing little waves forming and folding gently, over and over, as in a wave pool at a water park. The foggy lassitude that had hitherto dominated my morning was replaced by a determination to paddle with purpose. I focused on a wave, turned around started paddling hard, but it passed by without me. I began to turn around again and was startled to see an anomalous wave headed my way, bigger and faster than the others. Without much time to make a decision I made a quick adjustment on my board and started paddling furiously into it. I felt the wave pick me up, I hopped up to my feet with my signature wobbly grace, and by a stroke of uncharacteristic aptitude I stayed upright. What took place next can only be described as a fluke. If there hadn’t been any witnesses I wouldn’t believe me either, and even so, I’m not sure my recollections can be trusted. Either way, kindly entertain the possibility that for about five seconds I was surrounded on all sides by a tube of turquoise water, because that, somehow, actually happened. No one ever told me (nor did I ever inquire) what happens when the barrel closes out because, well, it seemed unnecessary. I just braced myself and sort of fell back and got tossed around for a few seconds, getting thwacked on the side of the head by my board. An undignified end to an otherworldly experience. Breathless from a combination of shock, euphoria and want of air, I hoisted myself back onto my board and found I was no longer alone. There were several pairs of bewildered eyes watching me. 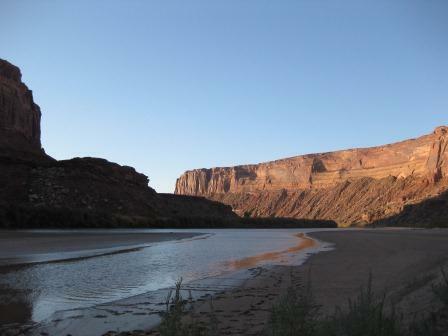 At certain points, the cliff walls that overhang the Green River seem to be on the verge of crumbling down at any moment, as if they’re carefully holding their breath and the dislodging of one particle of sand has the potential to send tons of boulders crashing down into the lethargic water below. 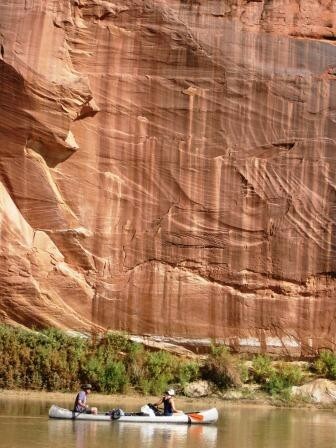 I entertained this thought while paddling through Labyrinth Canyon in a canoe, even though the looser-looking chunks of sandstone above had been resting there for who knows how long, and would likely stay put for the duration of our journey, if not longer. The stillness was suspenseful, until I got used to it. Unless a flash flood happened while we were there, which would have been super inconvenient, I was unlikely to witness any change at all. I do wish someone could make a time-lapse video of a blind arch becoming (and becoming, and becoming, and becoming) an arch. I’ll check back in maybe five thousand years. I’m grateful, of course, that the Green River kept its cool while it transported us through the canyon for the forty-six miles from Ruby Ranch to Mineral Bottom. We had a few more things going for us: we were the last group (six people, three canoes) launched by Tex’s Riverways for the year, so there was no one else with whom to compete for places to camp or to contradict the notion that we were intrepid explorers of a unique sort. Also, since it was late October, we avoided exposure to heat during the day (this is desert, after all) and the night chill only made the campfire more enjoyable. 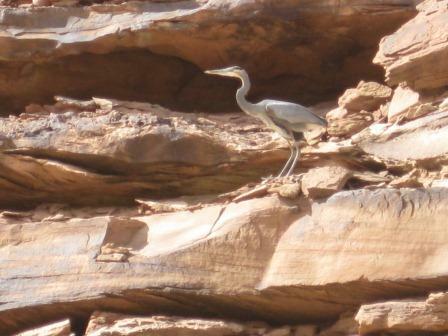 I’ve seen many herons but rarely one of the blue persuasion. The boys–Ben, Mike and Dane–had a couple advantages being at the back of the canoe. For one, they could trail their fishing lines behind them and cast frequently without snagging their canoe-mates, in theory. No fish were caught; the murky-water dwellers turned up their noses to the Powerbait. I’m not saying that there’s no enjoyment to be derived from even fruitless fishing, but at some point you have to put up the pole and paddle, dammit. The other advantage was that they could simply stand, turn 180 degrees and relieve themselves into the river without interrupting our progress. Since the only permissible place to piss was in the river, this advantage must not be underestimated. As for the ladies–Liana, Alexis and myself–getting the front seat is the advantage itself. 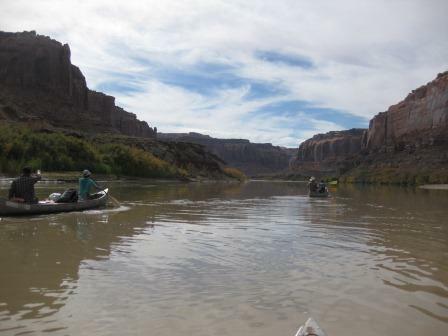 We did spend a lot of time on the river but we would pull up to the bank for a leisurely lunch and stop for exploration by foot through some empty river beds whose crust was damp but cracked. After the first docking experience during which we discovered one can easily sink up to the navel in silt, we became more selective about where to land. We (i.e., Alexis) referred to a detailed waterproof map to keep track of our progress and to decide on which bottom, strategically speaking, would work as a camp site. We explored the riverbed where the temptation to slather oneself with nutrient-rich clay is just too much for some people. Since conventional means of entertainment were absent on this trip, we entertained ourselves with roasting marshmallows, campfire stories and hot chocolate with peppermint schnapps. We found that canned re-fried beans, when placed directly into the fire, behave like a jack-in-the-box. I won’t go into Ben’s display of “freestyle canoeing” here but suffice it to say it made quite a splash. Here we saw the footprints of either a badger or large bird. Debate goes on. Within 24 hours of the last meal on the river, while Alexis and Mike went back to Colorado, the rest of us were checking into the Flamingo Hotel in Las Vegas, with its anemic animal sanctuary and cigarette smoke, showering for the first time in five days and then dashing over to the Bellagio for buffet. I saw the big platters of shellfish and thought of Tom Hanks in Castaway, picking up a crab leg from a buffet table after being rescued. The lobby had a stunning fall-themed display with an Oz-like animatronic tree, giant pumpkins, and elaborate waterworks, but it had nothing on our riparian wonderland. `Look ahead, Rat!’ cried the Mole suddenly. 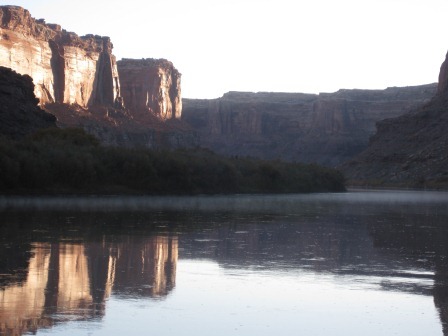 A river’s a great place for reflection. If your car radio is forever tuned in to NPR on the way to work, you’ve probably heard “Hidden Brain” with Shankar Vedantum, on NPR’s Morning Edition. I keep an open mind while listening, but often I wonder if mainstream psychology isn’t just a spin on common knowledge, confirmed by a study. Last week, as one example, the “Hidden Brain” discussion question didn’t really unlock any mysteries: Why do people take boring jobs? It turns out, people make up lovely ideas about a job they’re applying to, only to find out it’s unbearably dull after they take the offer. Please continue reading in the voice of Ira Glass. Which brings us to the theme of today’s program: Expectation vs. Reality. Now switch to the voice of David Sedaris. I myself have learned not to entertain expectations. I don’t mean the expectations that take the form of delusions (“I will get up at 6am and go to yoga class!”). Oh no, I entertain delusions on a daily basis. I mean the expectations that lead you down a rabbit hole on a quest for excitement and spit you out on the other side, sweaty and incoherent, asking yourself, Why the hell am I here, and when do we get donuts? I’d heard about A Passage Of A Few People Through A Relatively Brief Moment in Time (called the Passage Ride for short) on the radio, and was intrigued. According to the website, the Passage Ride is a bike ride that convenes every Wednesday night at a donut shop in Korea Town. The routes are long and ambitious, and every night, of course, has a theme. The organizers send out an email to subscribers–a teaser, if you will–on the day of the ride. The inspiration for the Passage Ride came from the work of these intellectual fellows called the Situationists and is designed to get people to “drop their usual motives.” Usually, the excursions–from what I’ve gathered–are interested in exploring a certain man-made or geologic feature of the city. Once, the riders rendezvous’d with a giant boulder inching its way down the street on its way to become the art installation Levitated Mass at LACMA. For two consecutive Wednesdays I was out of town, but read the peculiar emails. The night after returning to Los Angeles, I put my bike in the trunk of my car, gathered a water bottle and LED-equipped reflective vest into a pannier and drove to Korea Town. A broadcast of the original radio adaptation of War of the Worlds was on the air. In it, a terrified reporter dutifully narrates the scene before him: the mysterious spacecraft that had landed in a New Jersey farm was opening up, revealing a gruesome creature. Chaos ensues, and the reporter excuses himself from his audience momentarily while he flees. It was the night before Halloween, and the ride was called “The Devil May Care”. This time, there was no boulder, no phenomenon to muse over. The Devil may care, but let us tonight be unconcerned. Expectations be damned. I arrived at California Donuts at 8:30 pm and anxiously waited for others to show for about 20 minutes. At 9:00 we took off. Fumbling with my vest, I fell to the back of the group. We rode for a few miles down a busy boulevard, moving swiftly and in unison like a school of fish. We were in Silverlake before long, riding along the reservoir. After Silverlake was, I think, came Echo Park, then Pasadena, then Glendale. To be honest, I had no idea where we were most of the time. It was both liberating and nerve-wracking. We walked our bikes up steep, rocky switchbacks in a park; wandered into flood control areas; off-roaded up a hill to enjoy a scenic overlook; and descended down a ladder to a graffitied tunnel at the Devil’s Gate Dam located in the Arroyo Seco. 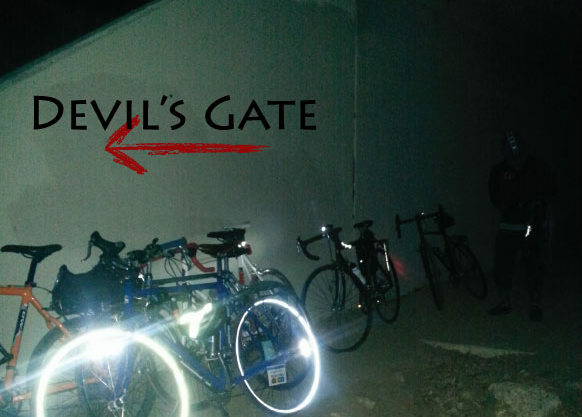 We lifted our bikes over fences and shimmied ourselves through. Although we must have trespassed quite a bit, it seemed like we had a special permit to bike anywhere we dared. About 15 miles in, I felt like I was peddling through mud, even on flat pavement. I wasn’t feeling very chatty and I wanted a blood transfusion or whatever Lance Armstrong used to take. Finally, kicking off the final third of the journey, we got to the downhill portion of the ride. I was overcome with relief although I had to keep stopping to give my hands a rest from squeezing the breaks. At the end of the 4.5 hour, 30 mile trek, the garish yellow light from the donut shop sign was a beautiful sight. My hunger overcame the desire to get home and crawl into bed immediately. I ordered a big donut which I inhaled in the car, while visions of my adventurous new Wednesday nights fell like crumbs in my lap.